Big Guys01493 854476work Shop - FashionBig Guys, on Northgate Street close to Great Yarmouth town centre, sells menswear for the larger gentleman with sizes from 2XL to 8XL at prices to suit your pocket. From socks to suits and vests to overcoats, Big Guys has a great range. 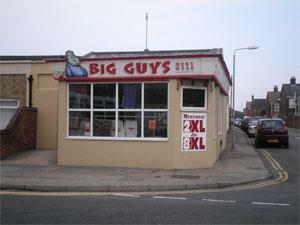 Big Guys, on Northgate Street close to Great Yarmouth town centre, sells menswear for the larger gentleman with sizes from 2XL to 8XL at prices to suit your pocket. From socks to suits and vests to overcoats, Big Guys has a great range. On arrival in Great Yarmouth proceed straight ahead at the Fullers Hill roundabout and bear left onto Northgate Street. Proceed along Northgate Street and Big Guys Menswear is located at the junction with Apollo Walk.